There are many national and local charities - large and small - which benefit from the generosity of agility people. 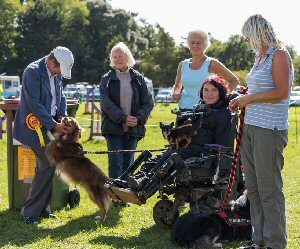 Thousands of pounds are raised by agility clubs and individuals around the country via demonstrations, sponsored walks and other events. What have you or your club done today? My name is Laura Evans and I need your help. 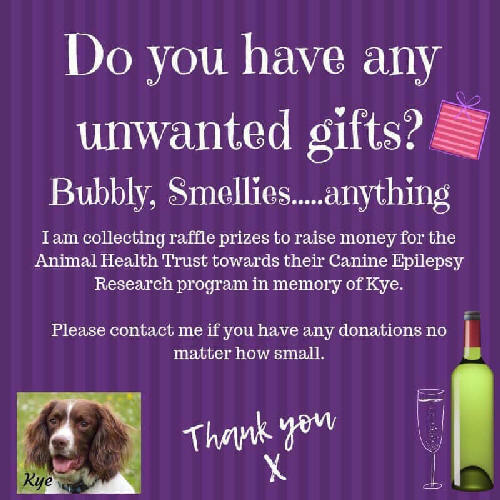 I fundraise for the Animal Health Trust and as such I am looking for vouchers or donated items to use as prizes when I do our charity raffles. Donated items can be anything - as long as they are new or in very good condition so basically anything you yourself would be happy to chose as a gift if you were lucky enough to win a prize. Like wise vouchers can be for anything too. Anything donated can be for a human or a dog, you decide. Everything donated will be most gratefully received. Kye was a beautiful happy, cool, laid back kind of a guy. Everything was fine until he received his first and only booster jab when he was 16 months old. Six days after his booster he fell seriously ill. He spent three days in and out of our own vets before being transferred to NDSR Referrals where he spent the next 10 days fighting for his life. 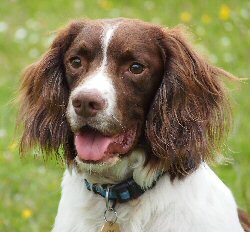 With the help of our vet and Fitzpatrick Referrals we 'coped' with Kye's seizures. Kye was refractory to meds so we tried all different combinations and meds to try to gain some 'control.' At his worst he went five days clustering with up to 18 seizures a day. At his best, he went 286 wonderful happy days seizure free. In between, we were dealing with seizures every 5/10 days. He went into status on the 15th October 2016 and we lost him on the 16th. Kye was only five and half years old. My sweet boy is now running free over Rainbow Bridge. Although Kye was not with us for long enough I truly believe he was sent to me for a reason. Cherish these special epi babies, take one day at a time and never never give up hope. So, my way of dealing with Kye’s loss is my fundraising. The Animal Health Trust are doing research into Canine Epilepsy which affects 6% of dogs in the UK alone, and this figure is rising. 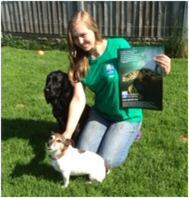 Help me to help the Animal Health Trust find a cure. Donated items can be posted to me or vouchers emailed to me using the contact details below. Please enclose your name and where you heard of my fundraising efforts. Posted items to: Laura Evans, Ideal Installations Limited, Unit 2 Newhouse Business Centre, Old Crawley Road, Horsham, West Sussex RH12 4RU. As some of you may already know, agility judge Carol Disley unfortunately suffered a major stroke and is presently in hospital in long-term rehabilitation. Her dogs are currently being fostered whilst she is unable to look after them. Liz Finchett is looking to raise funds to help towards their feeding costs and any vet bills. She will be holding a raffle at the Absolutely Barking Agility Addicts show on 3rd November. Top prizes include a six months subscription to Laura Chudleigh's Agility Secrets on-line website and a photo session with award-winning photographer Dave Finchett. Tickets are £1-00 each or 6 for £5-00. If you are not at the show, you can still purchase tickets via Liz through Paypal or BACS. Email her at liz.finchett@blueyonder.co.uk for details. A few weeks Jon Winney suffered a heart scare whilst training one of his dogs. The quick response of his trainer means than Jon is still here to tell the tale and after a short stay in hospital Jon has been sent home, with an Internal Defibrillator fitted. Unfortunately this means that he will have his driving licence revoked for 6 months and is unable to return to his regular job . Jon has always had a love for dogs and has been participating in Agility for many years, He is a judge, official KC measurer and a long standing trainer in the Essex area, helping many on their Agility career . He has in the last few years turned his hand to judging and can be seen at most local shows supported on his ring by his own club Red dog Agility. Jon can often be found at these same shows giving up his free time and helping out with the set up and marking out camping pitches. This is a worrying time for Jon and his partner Lee and so a JustGiving page has been set up so his friends can support him through this tough time. Dawn Taylor has been around the agility circuit for years. Despite having suffered from arthritis all her life and always found walking any distance difficult, she has never let that hold her back. 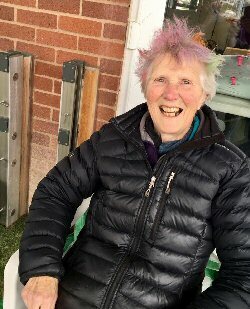 Over the years, she has given a lot to Agility, organising and running shows and helping on rings with her friend Sheila Taylor who also runs Dawn's dogs, Betsey and Nigel. On the last day of Dog in Need 2018, she went to a pub for an evening meal with Sheila and some friends when unfortunately she fell down some steps and broke her hip - and this was before she had even had a drink! Dawn spent some time in Ipswich Hospital where they operated on her hip. She was told she would be there for a few weeks until they could move her back to a hospital closer to her home in Wellingborough. Happily Dawn is now back home with her dogs, wowing doctors with her grit and determination. 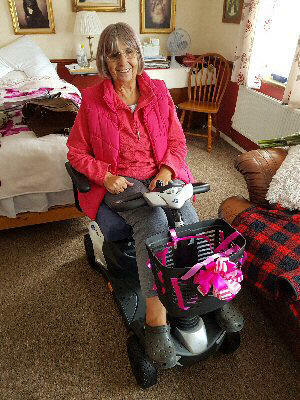 Last weekend at Letchworth Sheila was saying she wanted to buy Dawn a new buggy and asked Hayley Wilson if she could put something towards it. Hayley suggested they set up a Crowd Funding page to raise money towards a light weight buggy which could fit into Sheila's car, as the buggies cost a lot of money especially the lightweight ones. Hayley set up the page and shared it on Facebook. A week later they had raised enough money to buy a buggy that Sheila could fit in the back of her car. The agility family certainly came through for Dawn and Sheila. When Dawn saw the buggy and found out how it was paid for, she was overwhelmed. In fact, all three Dawn, Sheila and Hayley - were in tears. 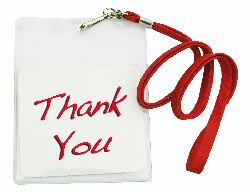 Both Dawn and Sheila would like to thank everyone for their kind donations to help get Dawn mobile again. Her plan is to make it to the Suffolk Five Rivers show at the end of September. She is a very determined lady so look out for her and her new buggy if you are there. Once again thank you everyone for your kind donations. Our agility family is the best. Samantha Foreman is taking part in the Maidstone Memory Walk 2018 on 8th September for the Alzheimer's Society because she wants a world without dementia. She has seen and heard first-hand how this condition affects people and their families and wants to beat it. Sammy's Grade 7 dog is a little too old to be taken and would only spend the time looking for jumps and dog walks but she will be taking her Grade 3 dog with her. Help Sammy and 110,000 others beat this bad condition by donating to her Just Giving page. Update: Sam raised £335 for her walk. There was 100’s of people there. She was a bit stiff afterwards but very excited she had done it. 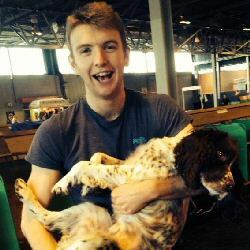 The auction to help raise funds to send Emilia Bowers and Sqiffy to the European Open Junior Agility Championships closes at 7pm on Friday, 29th June. There are currently 60 items to bid on including a Dog Vegas camping voucher worth £20 for their August show. Premier dog food, Champagne, dog books, leads, toys and treats for dogs and even a VR headset. Payments can be made via PayPal or BACS. Don’t know if we mentioned it last year but, when we were holding a stall in the Otley Council offices last year we bumped into the Mayor, Nigel Francis, who showed a lot of interest in our work. Then at Christmas we found ourselves one of the Mayors listed charities (he had 15 in total) on the back of the local Mayors calendar. Anyway, we forgot all about it until last weekend when we had a phone call inviting us to attend the outgoing of the current Mayor and the inauguration of the new one. The upshot was that we were handed a cheque for £4,500! So thank you so much, Nigel, and all the people of Otley who supported all the fundraising activities throughout last year. We are truly grateful fro every penny. Please help support a fellow agility lady. Ashley Carter's 'new to her' caravan stolen just one day before she was due to collect it. Unfortunately, it had not been insured yet. 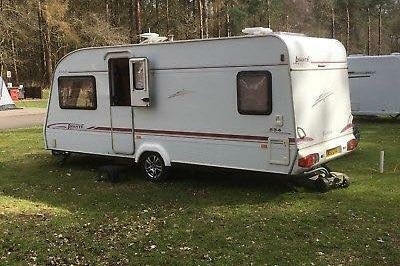 In the meantime, please keep an eye open for an Elddis Avante 534 2004 model - Vin number SGE5000EX4AVA1489. (Similar to the one above.) It was taken on 24th April from Washington, West Sussex. To donate to a fund to replace Ashley and Steve's caravan, go to Gofundme. Through contacts at Imerys and in conjunction with Canicross Cornwall, Max Archenhold has managed to get permission to use a disused clay pit which has a stunning luna-like lake at it's centre for a charity Canicross event to raise money for the Cinnamon Trust, a Cornish-based National charity for helping the old and terminally ill with problems faced by them and their pets. The site has stunning coast to coast views over the mid-Cornwall landscape. It is a very unique event because of its location and that the general public would not normally be allowed on the site. Now you can buy your very own pet portrait and help raise money to open a new dog rescue centre, Tristan's Pawprints! Megan Smyth is now taking commissions for her friend Rebecca Hoedemaker, a 23 year old widow who is in the process of starting the charity in memory of her beloved husband who died suddenly in December 2017, aged 27. 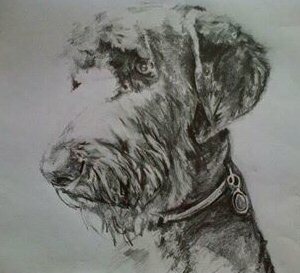 Portraits - dogs and people - are drawn personally by Rebecca and all proceeds go straight into the charity. Portraits are A4 size and come with a glass covers starting at £40. Please visit Tristan’s Pawprints on Facebook for more information. Carol Careless would like to thank all the wonderful people, friends and family who contributed to her shave for charity at the TAG Easter Show. On the day, people donated £233.40. Thank you to Rachel Rogers for allowing me to do the shave at TAG, Helen and Rob Taylor for your support and Roz Bradbury for the lift home! and to all you wonderful friends and family for the generous donations. In addition, ABAA members donated £95 and Annie Austin (formerly Knight) has contributed her year's tops which was another £70. There were also personal donations of £180. Altogether the grand total so far is £578.40 with hopefully more to come. Smokey Paws who provide pet oxygen masks to the UK's fire service. Cuan Wildlife Charity, Shropshire's only 24/7 wildlife rescue centre that rescues, cares for and rehabilitates sick, injured and orphaned wild animals and birds. Alex Davies to cover his entry and expenses to go to the World Games / Special Olympics next year. Alex is on the Autistic spectrum and unfortunately earlier this year lost sight in one eye. He always helps at our shows and always has a smile. Occasionally he runs Kera occasionally. This post is in praise of all the wonderful, kind and generous agility folk who have been helping the small charity Oasis Relief to bring safe, fresh and readily available water to thousands of vulnerable people in Zambia. Oasis Relief has been selling cakes at agility shows, car boot sales and market stalls 'Up North' since 2012. They have been going out to Zambia every year since 2005, and we have sunk 41 boreholes in total. Two of these have been dedicated to Northern Agility, and this year they specifically named one for Otley DTS and another for Weardale DAC. Altogether they have have raised enough money to sink 41 boreholes in total from the proceeds. 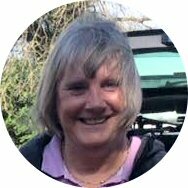 Campaigner and agility competitor Maureen Shepherd said, 'We pay all our own administrative costs and pay for the cost of travel and accommodation in Zambia each year so we can get a feel for what needs doing next at our two schools, the clinic and the skills centre. And, of course, we go to all the borehole sites and oversee the dig. 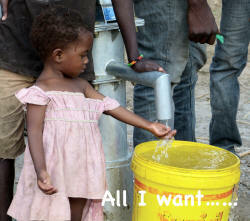 There are still a million communities in need that have no choice but to drink the filthiest water imaginable! So if you are travelling to Otley, Weardale or Lincoln shows this year, please help us by buying our cakes. They come well recommended. 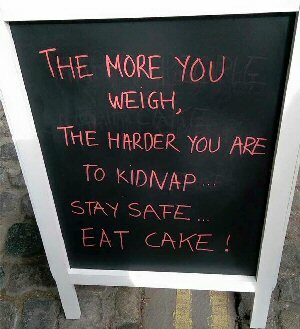 There will never be a better reason to put on a bit of weight! Nigel Perry is organising a demo on behalf of Dogs for Good (Dogs for the Disabled), to be held at KC House in Warwickshire on the 17th June 2017. The fun show is open between 11am – 3pm. The actual Demo will be run at about 12.00, and will last approx 30 minutes. If there are anyone out there who is disabled or has mobility issues who like to take part, contact Nigel Perry by email or ring 0161 776 9785 or m. 07950 636435. Charity Event Triumph for Team Agria! Congratulations to cycling Team Agria! Once again, they’ve conquered the notoriously tough Extra Mile Challenge, and in doing so, raised crucial funds for three exceptional charities – Medical Detection Dogs, Service Dogs UK and Willen Hospice. 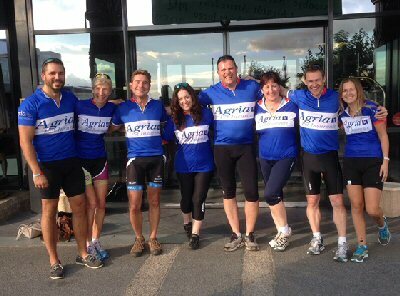 Having cycled in relay for three days covering over 500 miles, three countries and tackling daily elevations of around 12,000 feet, Team Agria is now very close to reaching their fundraising target and helping their charities have a great start to 2017. This was the 4th year that Agria Pet Insurance has taken part in the challenge, and this time three Agria teams went to help raise as much for the charities as they could. Agria’s Angels – the only all-girl team taking part in the event, and the two all-boy teams - Agria Forsakens – who lived up to their name with a team member forsaken through injury, cutting them to a team of just three, and Agria Willens. Every pound raised makes a real difference. For Medical Detection Dogs, this could be towards a £10 collar or a £250 puppy starter kit – ensuring their crucial work can continue. Could you help Team Agria reach their target? See http://uk.virginmoneygiving.com/team/Agria-2016 for more details. The Kennel Club has kindly sent 100 x ‘I’ve qualified my dog for Crufts 2017’ car stickers to Agilitynet to distribute to anyone who has qualified for Crufts next year -either as an individual or as part of a team. Basically, the stickers are free of charge but we do ask for a small, completely voluntary contribution to the Kennel Club Charitable Trust, a great organisation that funds research into canine disease and supports dog welfare. Cheques should be made out to the Kennel Club Charitable Trust, NOT Agilitynet. We are happy to send out stickers to anyone who has qualified for YKC events, Flyball, Obedience and Breed etc. in addition to agility but there is a limited supply so you need to apply quickly. Just send a standard size SAE to me at Agilitynet, 38 Northolme Road, London N5 2UU. Roger Williams and his trying to raise £45,000 for the Royal British Legion Dunkirk Memorial House Amenity fund 2017. This works out at £500 per person each year and every year. The money will be used for activities, entertainment, day trips, running costs of the minibus, residents hobbies like gardening, digital photography, computers, cooking and art etc. This provides these servicemen and women activities for their futures who served our country home and abroad, which gave our futures! Dunkirk Memorial House in Taunton is one of the Royal British Legion’s Care Homes, with a specialist dementia care wing. Like every one of the Legion's Care Homes, it is exclusive to ex-Service people and their dependents. Situated close to the village of Bishops Lydeard, eight miles from the bustling town of Taunton in Somerset, it is the only nursing home in the South West. Spacious and comfortable, it's somewhere residents can feel is their real home, for as long as they are with us. Currently there are several husbands and wives with relatives involved in Agility at this particular home in the South West including Roger's father (100 years old next month). Roger#s wide and son compete in both KC and UKA events all around the country. Dunkirk Memorial House has 60 rooms, all with en-suite facilities, and a 30 bed Dementia care wing. We know how much being independent means to our residents, so everyone has a key to their own room, as requested. Round-the-clock care from a team of experienced, registered nurses and dedicated care assistants ensures safety and security for our residents. Two residents will have their 100th Birthdays in November and December 2016. One of them received the Lord Lieutenant's award in August 2016 at 99 years old. He served in Burma in 1939-1945 as a Captain in the Royal Signals. He also served in the TA prior that. He learnt computers and digital photography at 90 yrs old and gained qualifications in both. He is one of the many veterans who have great stories to tell and great futures to live. Please give them a future by giving a donation large or small. Thank you and please share the link, so we can get this great cause go public thorough out the UK. With just a few training sessions left, Team Agria is gearing up for a 500 mile, three-day intense cycle relay with the Extra Mile Challenge to raise money for three very worthwhile causes. This is the second year Agria will cycle for Medical Detection Dogs. The charity trains bio-detection dogs to use their sense of smell to detect cancer in urine and breath samples and assistance dogs to alert individuals with severe medical conditions to an oncoming life-threatening event. It’s the fourth year that Agria Pet Insurance has taken part in this gruelling event, and this year the team will be supporting Medical Detection Dogs, Service Dogs UK and Willen Hospice. But it won’t be easy. 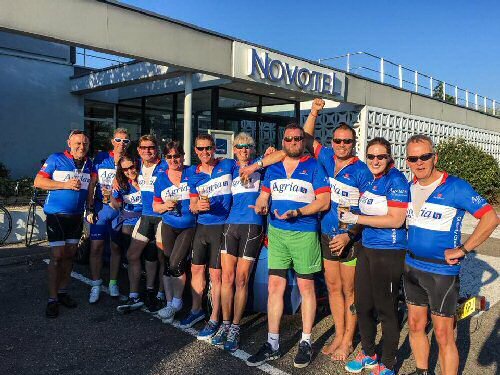 The 2016 route will push the twelve taking part to the limit as they cross from France to Germany and finally into Switzerland, whilst tackling numerous climbs of up to 4,000’ with daily elevations of around 12,000’. Service Dogs UK provides veterans from the Armed Forces and Emergency Services suffering with PTSD the benefit of specially trained assistance dogs. These are all rescue dogs trained at no cost to the veteran. And last but not least, Willen Hospice provides specialist care for people whose illness no longer responds to curative treatment (also known as palliative care). Willen Hospice provides care for people over the age of 18 in Milton Keynes and the surrounding areas. 'The Extra Mile Challenge is an incredible event and we’d like to say a huge thank you and good luck to everyone in the Agria team taking part – we’re delighted they’re supporting us. Agria’s fundraising will help Willen Hospice to continue to be there to care for our patients and their loved ones,' says Laura Conway, Challenges and In-Memory Fundraiser. Could you spare £5 for Team Agria’s sponsorship pot? They’d be so grateful if you could! See http://uk.virginmoneygiving.com/team/Agria-2016 for more details. Ruth Smith - Howell and her 11 year old daughter Abi are having their hair shaved off on November 19th at the Bitz 'n Bobz show. The money will go to Macmilla Cancer Support. 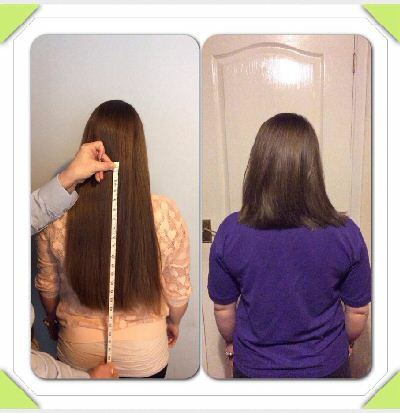 Their hair is then being donated to Little Princess Trust to make wigs for children and young adults with cancer. They are both doing this because they lost a very dear friend to cancer and Macmillans helped her and her family. Agility Against Cancer is very simple concept. The Dog Agility Community is a great family and families always try to help each other. 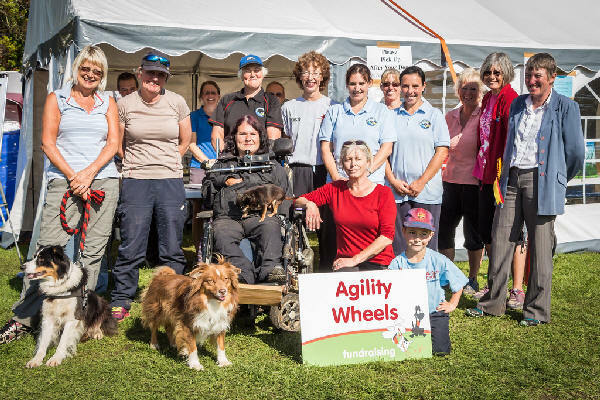 Seeing all agility people gather together to celebrate the life of Tracey Flower, one of our top agility competitors and also hearing the sad news about Yvonne Goode gave me the idea to make fundraising easy but also a way to bring our beautiful community together. Most of us have been affected in one way or another by cancer and together we can make a difference Agility Against Cancer was born and my vision is to create a sustainable fundraising platform to help anyone from our community. All profits will go directly to help fund treatment for the chosen person. We will help anyone in the agility community needing help. So this is where we are. This website is to help you join in that fundraising and to show that together we are stronger. If you have any ideas or suggestions please feel free to make them. We are not website designers or professional fund raisers just normal agility competitors so we will always be happy to listen or take any help you can offer. If you know of someone that need our help please let us know. 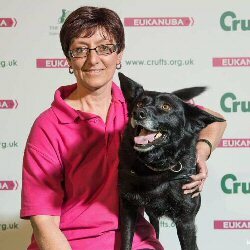 Many of you know Yvonne Goode and how much she has done to help abandoned dogs in the UK and abroad. Well, now Yvonne needs our help. She is suffering from drug induced leukaemia and secondary cancer, both very aggressive. Yvonne was diagnosed with breast cancer in 2013. After treatment, she was given the all clear, but in January this year she got the devastating news that she was poorly again. Consequenhtly she had radiotherapy and chemotherapy, which resulted in her getting leukemia. After having six weeks intense chemo in March this year, she got the news she wasn't hoping for. She has been having chemo since which is just keeping her going and has been told she is too high risk for stem cell treatment here. She has been offered a place in Germany for some pioneering treat. A small group of us are running an On-line Auction & Raffle on Facebook which will close at midnight on Sunday, 7 August. There are some amazing items on offer including a few multi-dog weekend breaks! 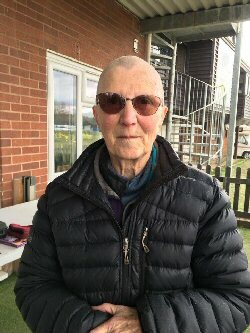 Jack Wilkinson has also set up a JustGiving page to raise £7,000 to help fund Yvonne's immunotherapy. Over the last two years, Carol Lynch, who was diagnosed with breast cancer in 2014, has raised over £2,000 for Marie Currie. Following treatment she developed serve painful peripheral neuropathy - symptoms is damage to the nerves- predominantly affecting her feet and hands.Her cancer is now in remission, but she still attends the Marie Curie Hospice in Hampstead for pain management..
Carol regularly attends agility competitions with her dogs Meg (now retired) and Sky. She uses this opportunity to raise funds for the Hospice, With special support from Orchard Agility Club, she holds collection at each of their shows. She said, 'Nothing stops me. 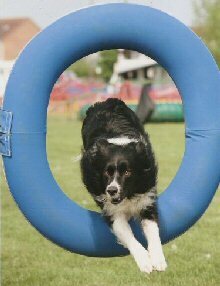 As you can see I still enjoy agility even if I can't really run any more. I will be round the shows this year trying to collect more funds for Marie Curie. After 19 months of fundraising, Pauline Angus will at last be four wheel driven. The target (£12,500) was reached in September 2015. A large proportion of the money raised was from the agility community, what an amazing achievement! Pauline Angus was born with a rare condition which rendered her a permanent wheelchair user. Her current wheelchair was not designed for muddy fields and agility and had seen better days (due to her lifestyle!) so we set about fundraising for a new 4x4 wheelchair, something more suited to the activities Pauline enjoys. Karen Fuller said, 'Pauline and I would like to thank every single person who donated, the clubs who allowed us to fundraise, the other agility folk and clubs who were inspired to raise funds themselves and agility businesses who donated prizes - you have ALL contributed to improve Pauline's lifestyle especially during the winter months when she would previously be unable to access many of her local fields, woods and beaches. The reality of this generosity is life changing for Pauline who will now have so much more freedom to enjoy the things most of us take for granted. An added bonus will be she should be whizzing around the agility shows next season without worrying about the ground conditions, so please do keep an eye open for her and make sure she is sticking to the 5mph speed limit! So a heartfelt thank you to every single person who donated money, gave raffle prizes, gave up their time, etc. You have helped change Pauline's life. Her new off-road wheelchair will give her so much freedom with her dogs - something that is priceless. Well done to everyone who donated, ate cake and bought raffle tickets at the largest coffee morning in aid of McMillan Dog Vegas this past weekend. The total raised for Macmillan is £630.00! They also have a further £95+ to add to the running total of what has been raised this year for the Ainmhithe Animal Rescue, which is their chosen charity for this year. They are starting to look towards our fundraising for next year and are looking for suggestions for which charity to support. They would like Dog Vegas members and competitors to have a think and let us know who you would like to support. Then we will put the most popular suggestions to a vote. Maureen and the lovely volunteers from Oasis Relief are busy baking cakes and making jam and preserves to sell this weekend at Otley Show. Just some advance notice for you to bring some extra money. Their baked goods and preserves got rave reviews last year so be sure to get there early! They will also be at Weardale show on the 1st and 2nd of August. 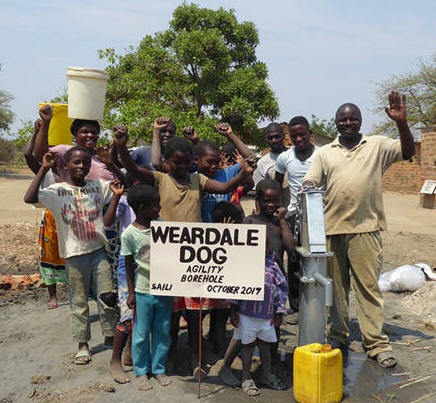 The aim this year is to use the money raised at agility shows to sponsor an actual borehole to provide fresh water for a village in Zambia. 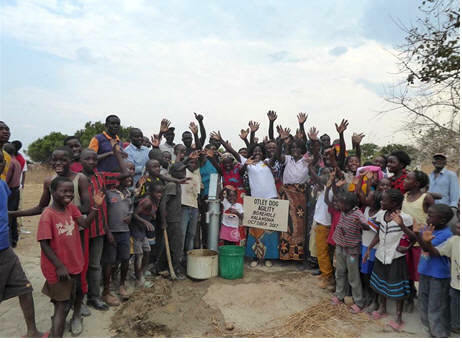 Oasis Relief is a small charity which has been supporting the sinking of boreholes out in Zambia for the last ten years. They have sunk 16 boreholes to date, and they estimate that this has provided clean, safe water for at least 30,000 people. To sink the hole, they hire a company who use an industrial drilling machine to dig a 6 inch diameter hole down to a depth of 50 metres. They then buy an India Mark 2 hand pump which is fitted by the local community led by Paul Swala, the project manager out in Lusaka. The total cost of borehole is approximately £1,200. There are many, many communities desperate for water, and Paul helps to identify the most needy villages or compounds before the charity's yearly visit in October. Last year they were very productive and sank seven boreholes within three weeks! Along with our water provision, Oasis has also helped to develop three schools as they believe that education leads to hope for a better future. The schools are all in areas where they have sunk a borehole. Every penny raised through selling cakes and jams goes directly to the charity. They pay for all the ingredients themselves and even pay for a slice if they want to eat it! They foot all administrative costs, and pay their own air fares and expenses whilst in Zambia. Fabulous cakes at Otley show today! My freezer is now full, ready for when I need some comfort food again lol! On Saturday, 6th June, a Team from Active Agility will be attempting Trekfest is one of the toughest charity treks in the UK, a 29 mile walk in 12 hours on the Brecon Beacons. The Team consists of Claire, Julia, Sam, Georgia and Kelly all members from our club. They are walking on behalf of the Clubs charity Pet Blood Bank who in the last few years have helped so many dogs with this amazing service. My own dog gave blood during his lifetime and was a willing donor. Some of you may have had experience in the past if your furry friends have need an operation which required blood this is the service which would have been called on. The team has already hit there original target of £500.00 but they would like to try and either double or possibly treble it. Donations go straight to Pet Blood Bank. Stephen Bartholomew said on FB, 'I don't normally ask anyone to give to any charity but this is very close to me and the clubs heart and if you can spare a few moments and just a few pounds every little helps. Last weekend Amy Bennett's good friend Jennifer Machon did a 'guess how many sweets in the jar' game to help raise money for her trip to the EO, and World Champions, representing Team GB in agility! Amy was lucky enough to have the winning guess! So Amy has decided to run the game again to continue to help her raise the money for Jen's trips this year! She has changed the amount of sweets in the jar and will be at Nottingham Champ this weekend JDA next week and Hinckley champ next weekend. Guesses start from 100 and finish at 400. 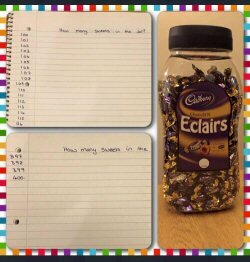 Each guess cost £1 and the winner wins the jar of sweets! It's easy and quick. so please help Jen raise money for her trips this year and support Team GB! Update: Amy has decided to continue the competition at Dartford / Keston as the right answer has not been guessed. Julie Smith is going to be running a charity stall at JDA next week and a few other shows this season to raise funds for Ainmhithe (An-va-ha) Animal Rescue. This is a small Irish rescue which helps all animals in need. Lots of dogs/ puppies have been rehomed over here in the UK due to a lack of homes in Ireland. Julie foster lots of puppies for them. Due to new legislation all dogs have to have a pet passport to travel. This results in extra costs for the rescues which takes its toll, so Julie is doing a doggy tombola for them. All prizes will be doggy related so hopefully useful prizes. If anyone has anything they can donate as a prizes she would be most grateful. Julie will be doing the charity stalls at JDA, Empingham and Dog Vegas (Thetford) so far. Hopefully more later in the season and next year. 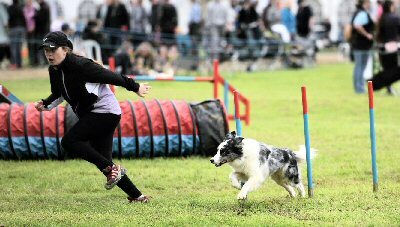 Anyone not at those shows can get things to me via Ian Hastie, Catherine Kendall, Nikki Emson and others that know me and train at Castaspell Agility or are going to those shows. A big massive thank you to all those who took part in the Hare and Hounds agility show Defib challenge this evening. 'Resus Ted' only got bitten three times and jumped on once. Thus far £80 has been raised far for the Hare 'n Hounds defibrillator. The competition was a Pay on the Day with a simple jumping course with purely jumps and tunnels set up in a heart shape. When the handlers got half way they had to do five chest compressions on Resus Ted, then complete the course. Competitors were eliminated if the dog bit Ted and the dog had to stay inside a marked area while resus took place. In 1st place was Alice Hunter and Charlie, 2nd was Alice Hunter with Charlie again, 3rd place Louise Laidler with Tizzy, 4th was Louise Laidler with Tizzy and in 5th place was Janet Nero with Drew. Alice will be taking home a new wooden jump as 1st prize. There were prizes to 5yj place so as the saying goes you've got to be in it to win it. The next Challenge will be on Friday evening, 22 May, around 6pm. You can have as many goes as you like and you jump your dog at their normal competition height and Anysize dogs can take part in their normal any size jump height. You can have as many goes as you like pay on the day £1 a run. Want to win one of 20 great prizes, including a 1-2-1 session with Natasha Wise, and help Cancer Research UK in the process? Selena Bray and David Isbister's baby is due on 18 February. Selena has agreed for a sweepstake to be held to raise money for Cancer Research UK. Entry is a donation of £2 but please feel to give more if you wish. Then put your guess in the comments box in the following format (lbs,oz/date/time) eg, 7.12, 18.02.15, 0700. The sweepstake will be based firstly on the weight of the baby, then the date and time of birth. This will give you lots of options. Harry was born on 25 March 2008 with a rare chromosome deficiency called 1p36 deletion syndrome, This means that Harry's physical and mental grown are affected as well as his motor skills, As he grows, Harry will need special equipment and care alongside his NHS care. All the money raised at this event will go towards his future care. Tickets are £60 per head and include a 3 course dinner and wine. There will be live entertainment with Jamie Johnson from The Voice, a disco, auction and raffle. The ball will be held at The Brand's Hatch Thistle Hotel, West Kingsdown, Kent DA3 9PS. We had a fabulous night, and we raised a massive £10,040 for the Harrison smith future care fund which was more than i expected, if people would like to see more about harry they can on his Facebook page Harrison smith future care fund. and yes we would like to renew hour membership shall i send a cheque or can i transfer the £110.00. We even had some agility people along at the Ball which was fantastic! 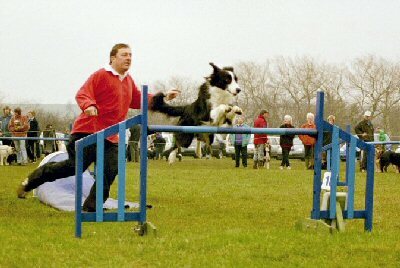 Neil Ellis, a regular competitor and judge on the agility circuit! for a while now, has really wanted to do a sky dive, but he thought it would only be right to do it for charity. So he has decided to raise money for Bowel Cancer UK to help raise awareness of the disease and to help those who currently suffer from it. His aim is to raise at least £400 in three weeks as he is jumping on the 26th September! Please pleaseee follow this link and help him reach his target. Even £1 will help to get there. Thank you soo much! Mike and Julie Stallard who got married at Dog Vegas last year are sponsoring a fancy dress Wedding Anniversary Pairs Special on Sunday evening of the 22 August Dog Vegas show this year. They are raising money to get a community electroic weelchair suitable for agility so all those who are wheelchair bound have access to our sport. Thus far club members at MJS Agility have raised and donate £1300-1400 for the cause. Their goal is about £3000 so they can get a good robust chair what will be kept at MJS but will be available for anyone to use. A huge thank you to Dog Vegas for all their support. Any donations are welcome. For details email Mike at mike.stallard2@btinternet.com or ring m. 07944 249350. It was a fantastic wedding anniversary weekend at Dog Vegas with my lovely wife Julie. A huge thanks to all that entered the Fun Pairs Sunday evening - especially all those that dressed up, fantastic! 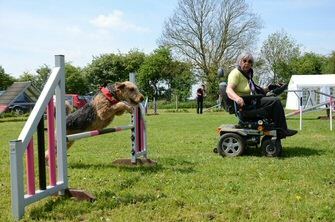 We raised approx £140 towards out communal agility wheelchair fund . A great laugh and good fun had by all. Our Dog Vegas were superb hosts, again allowing us to use their facilities in the evening. We shall be looking at doing something similar next year, if Vegas are able. Every year the Kennel Clubs makes 'I've Qualified for Crufts' car stickers available to anyone who has qualified for Crufts in either Agility, Obedience, Flyball, Ring Craft or Breed etc. You can buy them from the Kennel Club Shop or they are free from Agilitynet, providing that you send an SAE to Agilitynet, 38 Northolme Road, London N5 2UU. And here's an idea. If you are part of a Team which has qualified, you can ask for a stocker for each member. And don't forget the Reserves! If you send a voluntary donation to the Kennel Charitable Trust, we will send you two stickers - one for your car and the other for your dog van. It's a great cause and every little bit helps. The KCCT has been making a difference for dogs since 1987. It funds research into diseases and other health conditions in dogs, supports the training of dogs to help humans and helps rescue organisations. Thus far, it has raised more than £8 million in donations from dog lovers. Rebecca (Bex) Bebbington is running a Beginners games show on Monday, 9 June at 6pm at Dig It DTC. This show is exclusively for people who have not yet competed, have just started competing, or have yet to win out of beginners. This is a fundraising show for her expedition to Mexico this summer to conduct conservation research on an endangered population of Green Sea Turtles with Operation Wallacea. Sea turtles are increasingly popular as a form of wildlife tourism, but little is known about the effect of tourism on turtle behaviour. This current study is aimed to investigate the effect of tourism on immature green turtles (Chelonia mydas) in Akumal Bay, Mexico and to investigate turtle feeding preferences and possible overgrazing of specific sea grass species. Cancer touches so many lives. 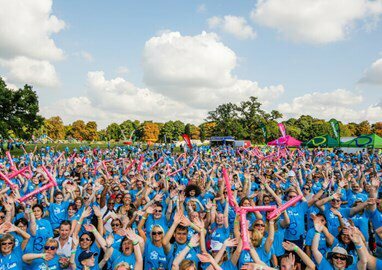 After two close family members lost their fight two years ago one of the East Yorkshire AC trainers, Vikki Cowling, decided to enter Race for Life Pretty Muddy in September at Clumber Park. Not wanting to take this challenge alone, Vikki decided to ask club members if they would like to join her. East Yorkshire Agility Club members are very close and supportive of each other. There are now 17 club members taking the challenge, and there will be many more supporting them by sponsoring or cheering them on on the day. Over the last three years EYAC has raised money for the local branch of Hearing Dogs by doing a sponsored walk, so they aren't new to raising money for charity. They will give 100% to this challenge and will encourage and support each other over this 5k muddy obstacle course where anyone of any ability can climb walk or jog all over cancer. After a steady start, I'm delighted to report a recent burst of activity has taken my total raised so far to £5,006.49 or 35% of my £14,000 target. I would like to thank everyone who has helped me get this far, be it by helping me write press releases and charity applications, by making donations including donations from not sending Christmas Cards, cooking bread pudding and cake sales and donating many and various items for draws/raffles and auctions. I have updated my website with a list of Thank Yous. Now things are happening quite quickly the list is growing all the time and I will update it again shortly. I really appreciate all the support from the fabulous agility community, old and young alike, including your encouraging words that sustain me through the dark days whilst I'm working toward being able to compete again. Somehow saying thank you doesn't really feel like enough, but for now it's what I can do. So, thank you to Sally Jones/Dogs 'r’ Dogs, Kelly Howarth, Sue Howlett/Loafers Cafe, Bincknoll DTC, Sue Rafter/South Bay Holiday Park and her team of Shirley French, her friend Jenny and Vera Burton, Lauren Langman and Sandra Adams of Devon Dogs and Adams Show, Rose Ash K9’s, Nutriment for powering Boogie, Verm-X and Bioflow, to name but a few. I'm looking forward to more of this summers fundraising events, The next of which is a draw and auction at the Kernow K9 Easter Show. All donations welcome. I've had some fabulous prizes donated already, including 6 2x2 weaves, a fine art original, a rocker board, agility DVDs, T-shirts, dog gear, champagne, wine, jewellery, hair products and various agility-related vouchers, some do come along and but some tickets. For a couple of the items, I'm running a Sealed Bid Auction on 18-19 April 2014 at Kernow K9 Show and on-line before. Please do take a look at that, too. After that I'll be at the UKA Phoenix Show on 24 May where I will be running a quiz, at the UKA Sands Show on 14 June 2014, running a Flick Flack Challenge and then at the UKA Aldon Show on 21 June 2014 where they are holding a Fun Class on my behalf - all of which I hope will be enjoyable and I look forward to seeing many of you there. When two Dog Agility friends from Somerset came up with the idea to raise funds for flood victims on the Somerset Levels, they could not have imagined the overwhelming response they would receive from the local community. Ruth Soutar and Marilyn Adams, who both live near the flood affected areas, thought a fundraising morning at their local training field would be the perfect way of doing their bit for the Somerset Flood Appeal. Little did they know their small event called 'Run For The Levels' would result in a surge of support from across the region, and grow into an independent show with 24 classes which is due to take place at Taunton Racecourse on Saturday, 29 March. The pair have been overwhelmed with the support they have received including Taunton Racecourse who are providing a brilliant venue, while equipment costs are being covered by First Contact Agility, Daybreak Dog Training, Norton Rosettes, Taryntimers, iSS Show Services, Minster Veterinary Surgery and many other clubs and individuals. A number of organisations are sponsoring the trophies for the classes including; Paws on The Levels, Feroda Agility, Mind to Win, Poetic Paws Training, CSJ Canine Feeds, Active Dog Services, Tone Veterinary Centre and Wilmott Mobility. 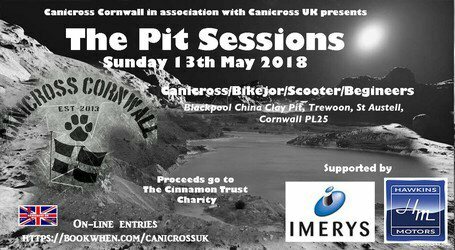 All monies raised will be donated to The Somerset Community Foundation Flood Relief Fund via Just Giving which is being used to relieve the immediate hardship individuals, families and communities are facing and support their recovery over the coming weeks and months. For many, it is the second time in two years they have been affected, and whole communities have been cut off for weeks. The response within the communities themselves has been magnificent, but there is only so much they can do for themselves. Thank you so, so much Agilitynet for supporting our fundraising event Run for the Levels SHow held on Saturday, 29 March. The day was fantastic - the weather, the people, the cakes, and the 403 dogs! We have been overwhelmed with the amazing generosity of the clubs, businesses and individuals that donated prizes, sponsored rings, lent equipment and helped on the day. Our raffle raised £1,596 and the event has so far raised £7,196 for the Somerset Community Foundation Flood Relief Appeal - all from Ruth & M's idea to hold a Saturday morning fundraiser at our little training field! Please pass our message of thanks on to others that we aren't aware of that have been also part of this achievement. I wish to publically thank Tuffley Agility Show for donating some of their rosettes for our Run For The Levels Charity Show. Entry for Run for the Levels show is now closed. There will be no pay on the day but you can still donate n help raise money for Charity. The original target was £3000, but so far over £4,000 has been raised. The goal is now £5,000. Any donations would be very much appreciated. You can contribute via the Run for the Levels Just Giving page or by text RFLS90 £ to 70070. Amy Bennett will be trying to raise money for Macmillan Cancer Support by having 14 inches of her hair cut and then donating it to a charity so that it can be made into wigs for cancer patients! Amy said, 'I'm sure every single person knows someone who has been brave enough to battle and beat cancer or unfortunately loose their battle to cancer! So this is my way of helping those brave people who are battling cancer helping to show my support! Not only is she cutting her hair, but she is also trying to raise as much money as she can. She has set up a Just Giving... page to make it quick and easy to donate . Her aim is to raise £1000. So far she have raised just over £600! She said, 'This is fab. I'm over the moon to have raised this much already as Macmillans does such an amazing job. I would really love to reach that £1000 target. I only have a week left until the big hair cut! Please visit my Just Giving page and help me make a difference! Thank you. Moira and Maddie from M & M's agility shows are pleased to announce that they were able to donate £700 to Prostate Cancer UK from the proceeds of a very successful raffle and from the show entries at their Christmas Cracker show. Following the success of their show, they are having another unaffiliated show on Sunday, 9 March. March Madness and take place at the Dog Training Barn. The schedule will be available soon.